The Shovel of the Earthmover is an advanced shovel and an upgrade of the Wand of Excavation. By default the shovel removes a 3x3 of whatever material you are digging, assuming the material could normally be demolished with a shovel. 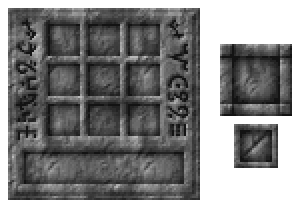 Furthermore, right-clicking the face of a block will create a 3x3 platform of the same material, similar to the way it digs, assuming you have enough of the material in your inventory. This can be used with non-earth materials for any kind of building. Note: the platform created is horizontal. Crouching while using the shovel nullifies the excess digging effect and acts as a normal spade. The Wand of Excavation must be researched before this tool becomes available. "Combining a wand of excavation with a Thaumic shovel you have created a peerless digging implement. When used to dig earth, sand and similar materials it will dig a 3x3 area instead of just one block. The shovel can also be used for construction. If you right click on the side of a block, it will attempt to place a 3x3 horizontal section of the same material in the world as long as you have sufficient blocks in your inventory. If shift is held while using this tool all of its special properties are suspended and it functions like a normal shovel." This page was last modified on 19 May 2016, at 05:44.